Shop press plans for a truly burly machine. This is the 2-Post version press which is a simple design, yet the design will handle requirements of almost any shop or garage. The anvil is independent, hence variations are easy to meet your project requirements. Also, the anvil moves with the hydraulic jack for direct force. Options for 20, 30 and 50 Ton Capacity. Plans Include one anvil design, however, it is interchangeable with other custom options. Shop press plans include complete blueprints and instructions. The design is simple, while tough enough to withstand the rigors of continued use. It is NOT a wimpy Chinese mail order piece. This press design will support the full advertised force without complaining, while made for versatility and ease of use. Each spindle is independently and infinitely adjustable to meet a wide variety of size and pressing requirements. Best of all . . . You Can Build It Yourself ! Options in the shop press plans include force capacity options of 20 tons, 30 tons or a full 50 tons or anything between. 50 Tons is 100,000 lbs force! There are also options for press height – allowing you to choose the right height for your shop. The anvil attaches to the hydraulic jack for direct force application, while any number of anvil variations or attachments are easy to meet the press requirement you have. Press construction requires steel cutting and drilling. These shop press plans include easy to follow, fully illustrated instructions as well as engineering options for 20 Ton, 30 Ton and 50 Ton capacity. Need more in a press? See our larger 4 Post Press! * For these shop press plans, load capacity is a static, vertical load, center between the posts. 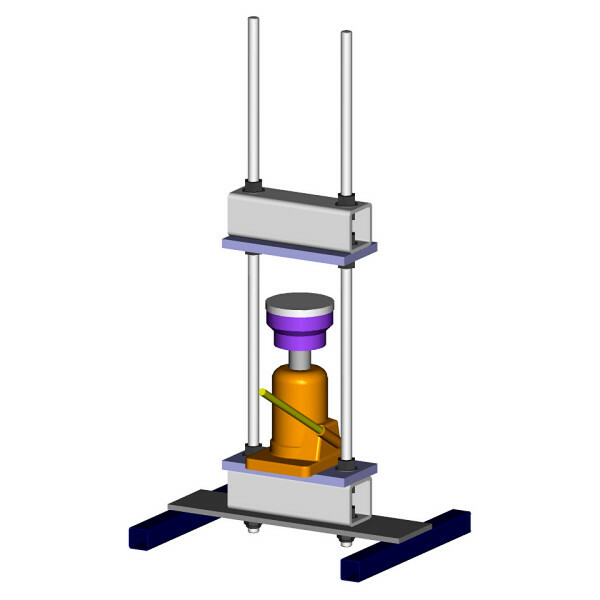 Furthermore, press strength depends on chosen materials, construction techniques, assembly methods and proper load application. Load capacity does not include capacity for purchased parts like the hydraulic prime mover. Take time to build it well, then it will serve you well. Always Use Extreme Caution and Proper Safety Equipment When Using A Press. For more, see the Shop Tools Plans including another press, gantry style cranes, and lifting accessories.